Charlie Lagarde won $1,000 a week for life in the Gagnant a Vie lottery. Charlie Lagarde bought her first lottery ticket and won $1,000 a week for the rest of her life. 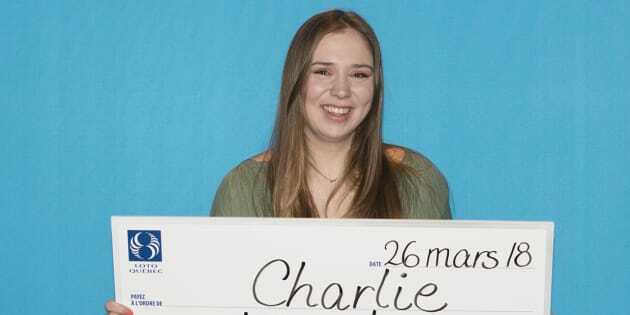 MONTREAL — A Quebec teen who bought a lottery ticket for the first time to celebrate her entry into adulthood has walked away with $1,000 a week for the rest of her life. Charlie Lagarde won the grand prize in the Gagnant a Vie lottery. Lagarde, who hails from the Monteregie area just southeast of Montreal, was celebrating her 18th birthday. Loto-Quebec said she went to local liquor store for sparkling wine and also bought herself a $4 scratch lottery ticket at a nearby convenience store on Mar. 13. After winning the jackpot, she took a few weeks to decide on whether to accept a lump sum $1 million payout or the $1,000 weekly lifetime annuity. A financial advisor told her to opt for the weekly amount given her age. "It's without taxes so it's equivalent to a salary of more than $100,000 a year, so it's a great start in life for that young lady," Patrice Lavoie, a spokesman for the lottery corporation, said Tuesday. Lagarde claimed her prize Monday at Loto-Quebec's head office in Montreal, joined by family and friends. She has big travel plans but also told lottery officials she wants to study photography and hopes to work one day for National Geographic.